Conflicts in family life are absolutely inevitable. And when those conflicts occur, you need to fight fair. The truth is, I really don’t like the word “fight” when it comes to conflict with your family members. Yes, you will argue, and there will be strong disagreements from time to time. But to me, the word fight implies that you are in some way trying to destroy an adversary, and surely that is not the case in a family situation. Or if it is, then I genuinely hope that you will not waste any time seeking professional intervention. Fighting fair means going into an argument with respect for this person you love and are going to have a relationship with for the long-haul, and with a spirit of looking for resolution, not vengeance. So when those moments arrive, as they most definitely will, how do you go about fighting fair? Never belittle or demean the person with whom you are in conflict. Avoid rolling your eyes or making sarcastic facial expressions. Deal with issues, not personalities. Make no personal attacks. Criticize the problem, never the person. Remember that anger is a valid emotion we all experience, and is neither right nor wrong in and of itself. Regardless of who’s at fault in a particular argument, don’t place the blame, but fix the cause. Discuss the matter at hand. Stick to the subject. Don’t store up a laundry list of grievances and pull them out to use as ammunition every time you have a disagreement. Don’t use generalizations (you always or you never). Truly listen to what the other person is saying. You are not a mind reader, so don’t presume to know what he or she is thinking. Be aware of your body language. Keeping your arms open—not crossed— and your shoulders relaxed signals to your family member that you are receptive to what he or she is saying. Allow a cooling off period, but don’t walk away until you’ve agreed to a follow-up time. Don’t hit below the belt by using the other person’s weaknesses or sensitivities to hurt him or her. Recognize that nobody is perfect, and make sure that is not the standard you are expecting from your family members. Remember that your children are learning how to handle conflict by watching you. Be a good role model. Finally, when you have your conflicts, it’s so important that you forgive. There are almost never any cases where the either party is 100% right or wrong. Forgiveness in its purest form means being released form the effects of the wrong we have done. Forgiveness extends love when punishment or hostilities may be deserved. Forgiveness replaces rejection with acceptance and relinquishes the right to revenge. Above all, forgiveness chooses not to continue to bring up failures of the past. Remember, the family you’re with right now is the family that you love and want to have as part of your life forever. So the next time you feel the heat rising and see that argument getting ready to boil over, remember that your objective is not to defeat an enemy, but to find common ground and move forward, together, toward your happily ever after. Do you have any tips or suggestions to add to the list of ways to fight fair? Please share your thoughts with us in the comments below! Awesome and timely advice! 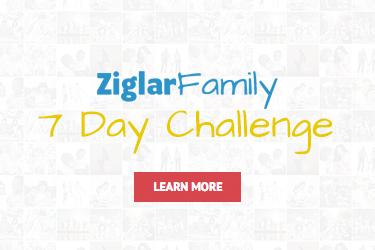 Thank you, Ziglar Family! My husband and I were just talking about this today. Being honest in a loving way that you love the person not the behavior or sin. We need to know we are loved no matter what and that we are safe in letting down our walls to be love, healed and helped to become whole through Christ. Thank you so much for the blog post, I found it very useful, for us in our family. I am really blessed, and thank God and Ziglar Family for this article. Tears are in my eyes now, as this article reminds me of what I have done to my children, many donts in the list are just what I did to our children. I am trying practicing tips in the list in raising our 5 children. Sory for language. Please allow me sharing this article.